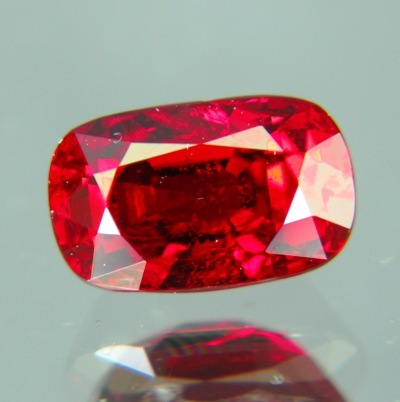 Comment: Crossing the high hurdle of 2 carat unheated ruby but doesn't cost a fortune, yet. On the side-images you can see several natural dents in the outer surface. These are not considered inclusions, however, there is a tiny growth swirl inside the stone (which only a pro will find with lens). Without that puny little inclusions this 2+ ruby would qualify as 'free of inclusions'. This is a tradtional hand-cut, not precision cut, but flawless and it has kept the magic 2 carat intact. 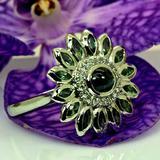 Slender lengthy shape will fill even a 10+ size gent's ring. No pink, no purple, some orange, dark but not brown (ignore handshots), no window. This is not a flashy gem for quick impressions but with Medium Dark 80 a dense tranquil character that blossoms with time and attention, as all good gems do. 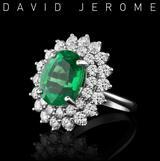 We offer additional GIA certificates free of charge on this gem if requested. Note the different characters with different lights and backgrounds.